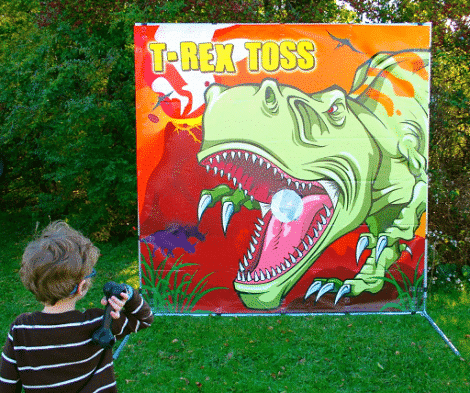 This TREX Toss Game is great for birthdays, corporate events, fundraising and more! The TREX Toss Game includes a 7’x7′ framed vinyl canvas, dino bones, and a carrying case. SKU: PJC08. Categories: Party & Event, Miscellaneous Party, Games/Entertainment. 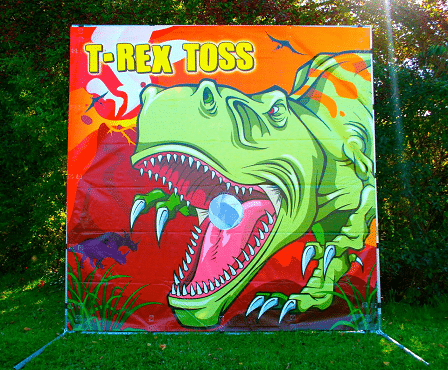 Tags: dinosaur game, party game, trex toss game. The block stacking game is a great addition to any party! 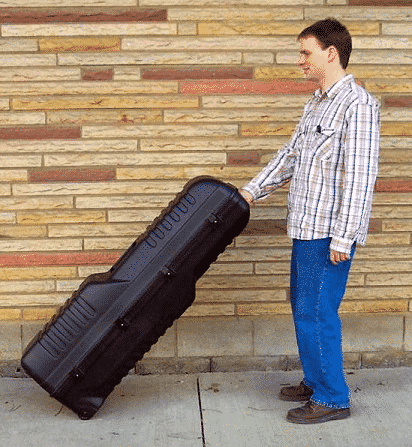 It includes 72 blocks (1.5″ x 3.5″ x 10.5″ each) giving it a total height of 3′ when the game is begun. This game comes with 2 regulation sized boards, 8 bean bags, and instructions. This is a great game that ANYONE can play, even the kids! A great addition to any party. This Golf Challenge Game is great for birthdays, corporate events, fundraising and more! Great fun for all ages and skill levels! The Golf Challenge Games includes a 7’x7′ framed vinyl canvas with velcro, velcro golf balls, a left and a right handed golf club, and a carrying case. This is a regulation size volleyball set which includes the net with attached poles, 2 rope tie-downs, 4 stakes, boundary lines, a volleyball, and a carrying bag. The poles can be adjusted to amateur height, women’s professional height, or men’s professional height. This is a GREAT volleyball set and can turn a good party into a great party! begins. Court switches or exchanging courts occur at specified times during the game. In a 15-point game, courts are exchanged each time the total number of scored points is a multiple of 5. In an 11-point game, teams exchange playing courts each time the total number of scored points is a multiple of 4. Rally Point Scoring: In rally point scoring, either the serving or receiving side scores a point whenever a team fails to serve properly, return the ball, or commits any other fault. • Ball in: The ball is “in” when, after being put in play, its first contact with the ground is on the playing court or a boundary line. • Ball out: The ball is out when after being put in play, its first contact with the ground is completely outside the playing court. – It touches an object outside the court, an overhead object or a person out of play. – It touches the antennas, ropes, posts or the net outside the antenna. • Each team is entitled to a maximum of three contacts to return the ball to the opponents. • A player may not contact the ball consecutively, except during or after a block or at a team’s first contact. • A player may touch the ball with any part of the body. • The ball must be contacted cleanly and not held, lifted, pushed, caught, carried or thrown. • The ball cannot roll or come to rest on any part of a player’s body. • An exception is allowed during the defensive play of a hard driven ball. At this time, the ball may be momentarily lifted or pushed. serving and blocking, are attack hits. • You cannot contact the ball within the playing space of the opponents. and/or players at the net. make contact of the ball after the block. • For four-person and six-person play, blocking does not constitute a team contact. Any player may make the first contact of the ball after the block. contact and any player may make next contact. • Assisted Hit: A player takes support from a teammate or any object in order to reach the ball. various parts of the player’s body successively. • Held Ball: A player does not cleanly contact the ball. • Player/Net: It is a fault for the player or their clothing to touch any part of the net. provided this does not interfere with the opponent’s play. intentionally interfere with any legal attempt to play the ball on their court.